Hey, the Gizmodo Gallery is open again, and we've got some fun stuff happening today and only today, including a reader meetup with free t-shirts and cheap beer. 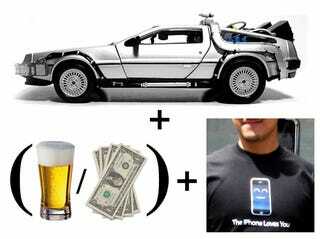 And a DeLorean. Who&apos;s Monkey Boy running from? • The DeLorean, with full Back to the Future rigging, will be here at 5pm, parked in front of the Gallery. Maybe we can arrange for rides? • The reader meetup is happening tonight. The Gallery will be closed to the public at 8, but if you're a reader, knock on the REED ANNEX door and say the password ("password") for a private viewing until the drinks across the street happen at 9. We'll also be giving away a few iPhone t-shirts that Jesús designed for the original iPhone launch, and in the bar across the street (The Annex, not to be confused with REED Annex) beers will be $4, which I'm told is some kind of freaking discounted price in NYC. Got that? Full details for location below. • Matt Buchanan and Adam Frucci have told me they think they can take on ANYONE in Call of Duty. And if you come in and beat them between 4PM-5:30pm, I've got some prizes for you from our giant stash. Of course, we also have all the gallery items we've run before, plus some newly arrived Bug Labs gadgets and a 20th Anniversary Mac which we're giving away—more later on that.